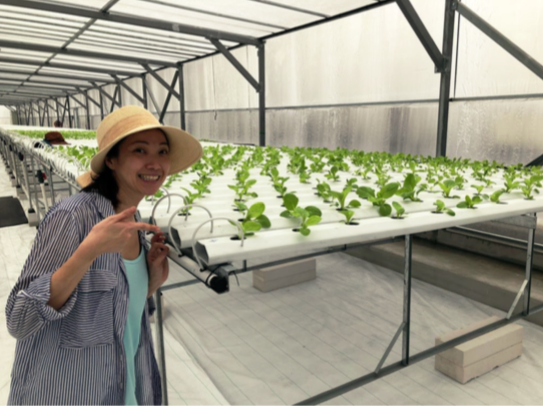 ComCrop, Singapore’s first and premier rooftop farming company, has completed the “Phase One” portion of it’s new rooftop farming complex in the Woodlands section. This is ComCrop’s second rooftop operation, with it’s initial rooftop farm atop the Scape Building on Orchard Link. Recently, Joe Swartz, VP of AmHydro traveled from Massachusetts to Singapore to finalize system operations and conduct grower training with ComCrop CEO Peter Barber and his growing team, using AmHydro’s 3-stage NFT growing system. ComCrop’s Sales and Outreach Coordinator Darren Tan, Board Member/CoFounder Allan Lim, CEO Peter Baber, and Farm Manager Samantha Chin at ComCrop’s original farm site. AmHydro has developed rooftop farm systems for notable Urban Farms Gotham Greens and Sky Vegetables in the US, and Lufa Farms in Canada. With the first several plantings underway, ComCrop is already looking toward Phase 2 Expansion for early 2019. This rooftop farming complex will ultimately consist of 8 rooftop greenhouses when complete, and will total over 35,000 square feet. Other sites across the city are also being evaluated for future farms. Feb 5 New Rooftop Farms Sprout Up In Singapore!